3900 series line was designed for use in areas of radiological airborne contamination. Available in 12 mil for heavy duty jobs or 6 mil for lighter duty. Styles are constructed of NFPA-701 compliant materials for added safety. 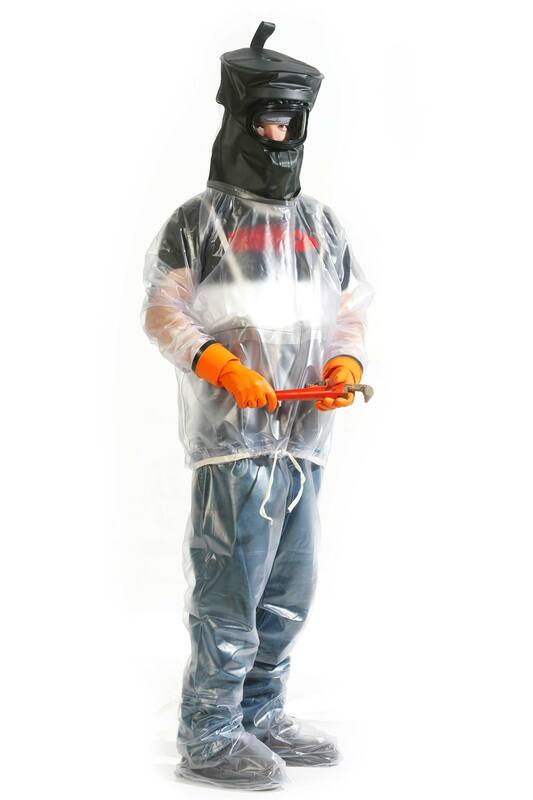 3900 series is available with over-sized hoods to accommodate hardhats. Manufactured with a noise suppressing plenum for optimal communication. Seams are RF welded for superior strength and durability. Pullover jacket with attached semi-rigid polyurethane cuffs. Helmet front and top constructed of 20 mil black opaque PVC. Helmet back constructed of 20 mil pressed polished clear PVC. 40 mil semi-rigid plastic for viewing lens. Includes soft cloth chin rest and ratchet style headgear. Pullover Pants with attached boots. Pants held in place with fire retardant suspenders and drawstring. Extra high waist allows the pants to be drawn up over chest area resulting in double protection of vital organs. Breathable Tyvek neck and waistband. Adaptable to many in-plant air systems.